Scorebuddy is an SaaS platform that allows you to improve the quality of your customer support system by providing multiple tools to score your engagements with customers, whether via emails, calls or chats. Based on the score results, you can then adjust critical parameters on the fly until you achieve optimal results. Scorebuddy designed their dashboards to be flexible and intuitive so agents can make the most of their capabilities, leaving room for users to collaborate and communicate with transparency for best outcomes. For deeper insights, the tool can analyze your system’s data to bring out trends and patterns to inform your next decisions.ies. Within minutes of accessing Scorebuddy, a user can build a quality monitoring form with the app’s simple form builder. Scorebuddy includes a number of best practice quality monitoring forms including ones designed for specific customer service channels (email, live chat, phone, Twitter). Users can copy and/or edit these templates as they wish. The beauty of Scorebuddy is that you don’t need to involve your IT team if you want to use it. It’s made for non-techie users and requires no integration. Since it is a cloud-based software-as-a-service tool users don’t have to worry about installing the software. They can simply log in online and start quality monitoring. Scorebuddy is so easy to use that its customers don’t need training to use the tool. The vendor offers free demos and if required they can give training, but 99% of the time the demos meet the need. There are video tutorials available in the Help menu too. Reports on quality monitoring results are automatically populated. A comprehensive filter button allows users to report in multiple ways: per dates, team, groups, agents, supervisors, forms, and channels. Simple pricing! 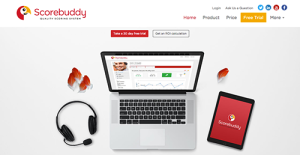 Scorebuddy is a pay-as-you-use service with no set-up fees. Individual agent and supervisor dashboards are offered if users opt for the additional Agent Insight module. Agents can receive email alerts on new results and can self-score with this option. What Problems Will Scorebuddy Solve? Many companies use spreadsheets, Access, SharePoint or other off-the-shelf solutions to quality monitor their employees. Many of these are laborious, time consuming and require a good deal of effort for reporting. Scorebuddy’s Reports feature automatically generates reports and often this eliminates the need for any manual report maintenance. Scorebuddy also offers an additional Analytics module which is a comprehensive reporting tool allowing users to do all their reporting within the tool. At the click of a button they have all the info they need. Often quality monitoring solutions are not optimized for sharing information, often they are great for the Quality Analysts/Evaluators/Managers but for everyone else it is anything but convenient. Scorebuddy was designed to be used by everyone in an organization and with over 10 different types of users and customizable access it works for everyone. Individual exporting, emailing and printing of paper forms and reports will be a thing of the past! Since each organization has specific business needs, it is prudent for them to refrain from looking for a one-size-fits-all perfect software system. Needless to say, it would be useless to try to find such an app even among widely used software solutions. The clever thing to do would be to catalog the various essential aspects that need consideration such as key features, finances, skill levels of staff members, company size etc. Then, you should do your homework thoroughly. Read some Scorebuddy reviews and look into each of the other systems in your shortlist in detail. Such in-depth homework can make certain you weed out ill-fitting platforms and zero in on the app that provides all the aspects you need for business success. How Much Does Scorebuddy Cost? We realize that when you make a decision to buy Customer Support Software it’s important not only to see how experts evaluate it in their reviews, but also to find out if the real people and companies that buy it are actually satisfied with the product. That’s why we’ve created our behavior-based Customer Satisfaction Algorithm™ that gathers customer reviews, comments and Scorebuddy reviews across a wide range of social media sites. The data is then presented in an easy to digest form showing how many people had positive and negative experience with Scorebuddy. With that information at hand you should be equipped to make an informed buying decision that you won’t regret. What are Scorebuddy pricing details? What integrations are available for Scorebuddy? If you need more information about Scorebuddy or you simply have a question let us know what you need and we’ll forward your request directly to the vendor.